In rare cases, the orange lamp on the Canon Battery Charger LC-E6 will blink rapidly at regular intervals when the Canon Battery Pack LP-E6 is inserted. 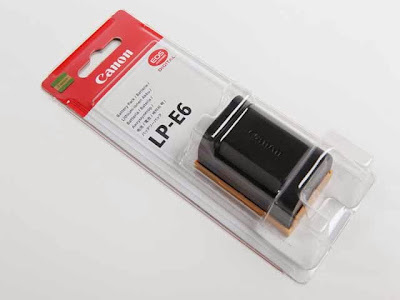 In such cases, charging the Canon Battery Pack LP-E6 in the Canon Battery Charger LC-E6 is not possible. This symptom may occur when a Canon Battery Pack LP-E6 has been discharged due to being unused for a prolonged period of time, such as when it is first purchased. If this occurs, please follow the procedure below. Plug the Canon Battery Charger LC-E6, with the Canon Battery Pack LP-E6 inserted, into a power outlet. If during this time the orange lamp blinks once per second, please continue to charge the battery until the green lamp lights up, which indicates a full charge. At this point, the battery is ready for normal use, and there is no need to follow the remaining steps. If during this time the orange lamp blinks rapidly, please move on to Step 3 of this procedure. If the orange lamp blinks rapidly, remove the Canon Battery Pack LP-E6 from the Canon Battery Charger LC-E6. Reinsert the Canon Battery Pack LP-E6 into the Canon Battery Charger LC-E6. The Canon Battery Charger LC-E6’s orange lamp should begin to flash slowly (once per second) and charging will begin. Please note: If the orange lamp blinks rapidly again, please repeat steps 3-5 above. If, after a third attempt, the Canon Battery Pack LP-E6 does not charge, please contact the Canon Customer Support Center for assistance. Charge the Canon Battery Pack LP-E6 until the green lamp on the Canon Battery Charger LC-E6 illuminates, signifying that the Canon Battery Pack LP-E6 is fully charged. The situation may also occur when attempts are made to charge non-genuine Canon Battery Packs in the Canon Battery Charger LC-E6. However, the procedure provided above does not apply to the use of non-genuine Canon products. Please register your Canon Products. By registering, we will be able to notify you via email when future firmware updates become available for download.